Pre Cut, Back Support - SHIPS FREE! Pre Cut, Foot Support - SHIPS FREE! Pre Cut, Knee Support - SHIPS FREE! Pre Cut, Neck Support - SHIPS FREE! Pre Cut, Shoulder Support - SHIPS FREE! Pre Cut, Wrist Support - SHIPS FREE! Whether you're recovering from a sport's injury or a muscle sprain, Kinesio is the proven leader in providing support through rehabilitative taping techniques. Pre-Cut Kinesio Tape promotes active recovery and performance for tendons, ligaments, fascia and deep tissue. The tension on the tape has the ability to relax or stimulate the muscles. The tape stretches and can be applied in hundreds of ways. Kinesio Pre-Cut Tapes support chronic swelling, back strains, back pain, ankle sprains, herniated discs, subluxations, knee conditions, shoulder conditions, hamstring or groin injuries, rotator cuff injuries, whiplash, tennis elbow, plantar fasciitis, patella tracking, carpal tunnel syndrome, lymphedema, and the list goes on. Choosing the pre-cut tape saves you a step and provides a convenient ready-to-use kit with strips for specific regions to get you on your way to healing. Pre-Cut Kinesio Strips come in "I", "X", "Y" and other specialized shapes used for specific applications. These tape configurations are supplied in the kits to target the back, neck, shoulder, knee, wrist and foot. Simply select the specific target region, follow the easy-to-apply tape instructions and get relief, all from the convenience of your own home. Each packet comes with exactly what a user needs for a single-use. The specialized cotton-fiber construction of Kinesio resists moisture penetration and allows quicker drying. The strips won't limit range of motion and is light weight and breathable making it easy to wear under clothing or while exercising. The strips are hypoallergenic and latex free to be sensitive to the skin. The strips are for a single-use but can be worn up to three days. 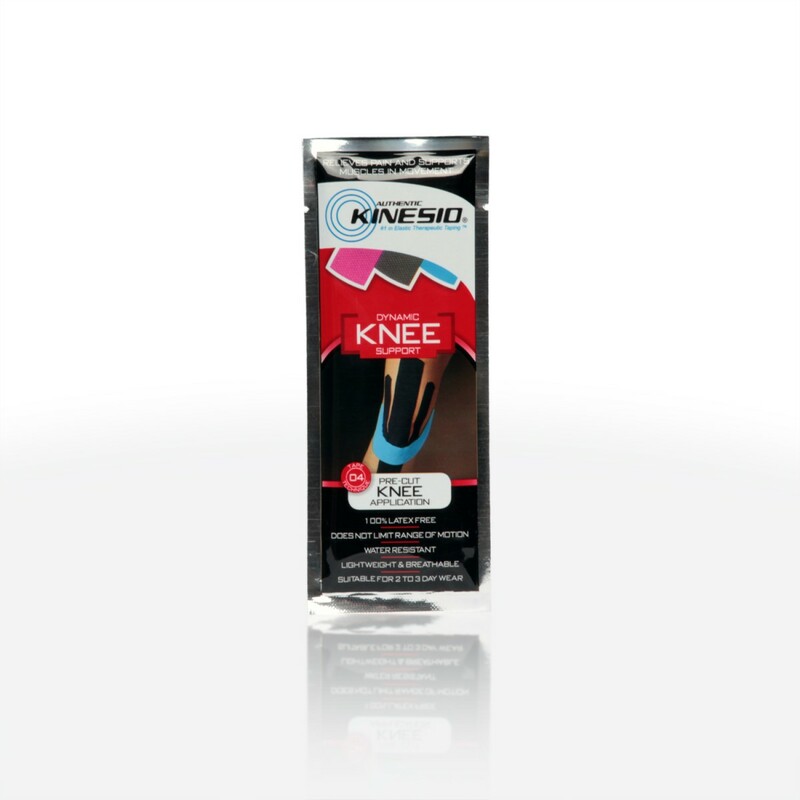 Kinesio Pre-Cut Back – contains three "I" strips, two black and one pink. Strips are placed to relieve back pain, back stiffness and back spasms by supporting overstretched back muscles, lower back pain, lumbago and sciatica. 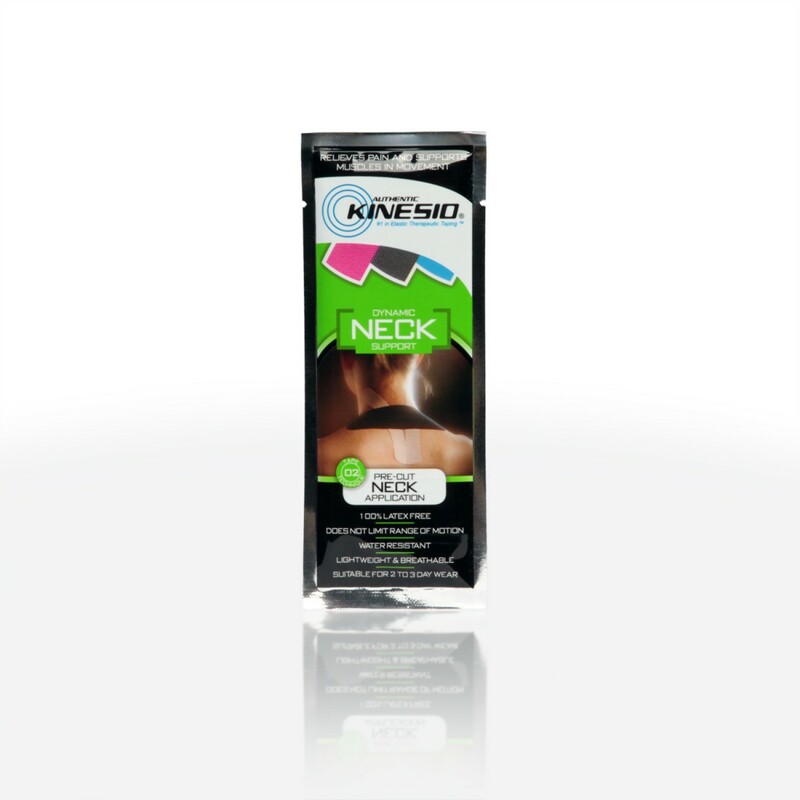 Kinesio Pre-Cut Neck – contains two beige "Y" strips and one black "I" strip. Strips support neck to alleviate pain caused by muscle strain or ligament sprain. It helps with stress and tension headaches and whiplash. 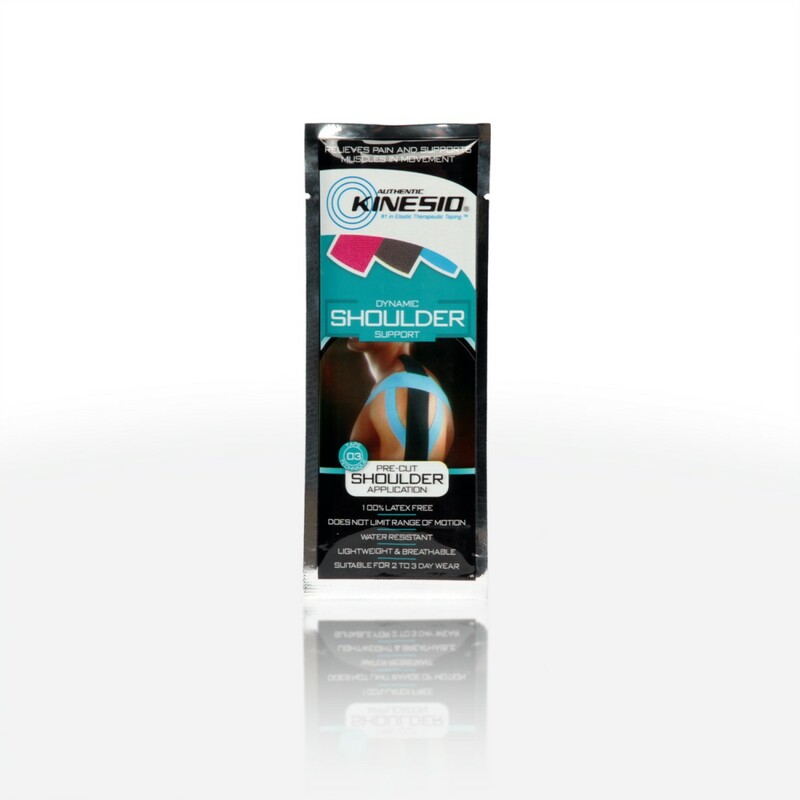 Kinesio Pre-Cut Shoulder – contains one blue "Y" strip, one black "I" strip and one blue "I" strip. The strips support shoulder muscles to relieve shoulder pain from rotator cuff injuries, bursitis and frozen shoulder. Kinesio Pre-Cut Knee – contains one black "I" strip, one blue "I" strip and one black "Y" strip. The strips support the knee and patella to alleviate associated pain and swelling from meniscus tears, runner's knee and swollen and torn ligaments. Kinesio Pre-Cut Wrist – contains three "I" strips, two black and one blue. The strips support the wrist by relieving pain and swelling from carpal tunnel syndrome. Strips also provide wrist support for overused and weak wrist muscles and alleviate associated pain. Kinesio Pre-Cut Foot – contains a set of two pink "fan-shaped" strips and one blue "I" strip. The strips support the foot to treat and relieve foot pain associated with plantar fasciitis and Achilles tendinitis. It also supports the arch of the foot for individuals with flat feet or who wear unsupported shoes. Kinesio Pre-Cut Back – contains two 12" x 2" "I" strips, and one 11" x 2" pink "I" strip. Kinesio Pre-Cut Neck – contains two 11" x 2" beige "Y" strips and one black 11" x 2" "I" strip. Kinesio Pre-Cut Shoulder – contains one blue 11" x 2" "Y" strip, one black 12" x 2" "I" strip and one blue 12" x 2 "I" strip. Kinesio Pre-Cut Knee – contains one black 12" x 2" "I" strip, one blue 11" x 2" "I" strip and one black 11" x 2" "Y" strip. Kinesio Pre-Cut Wrist – contains a blue 11" x 2" "I" strips and two black 12" x 2" blue strips. Kinesio Pre-Cut Foot – contains a set of two pink 10" x 2" "fan-shaped" strips and one blue 11" x 2" "I" strip. When applying the tape, make sure to rub the entire tape strip in order to activate the adhesive. Discontinue product use if skin shows signs of sensitivity. Seek medical advice if the skin doesn't heal within five days. Consult medical advice for individuals with diabetes, pregnancy, poor circulation, nerve damage or skin condition.